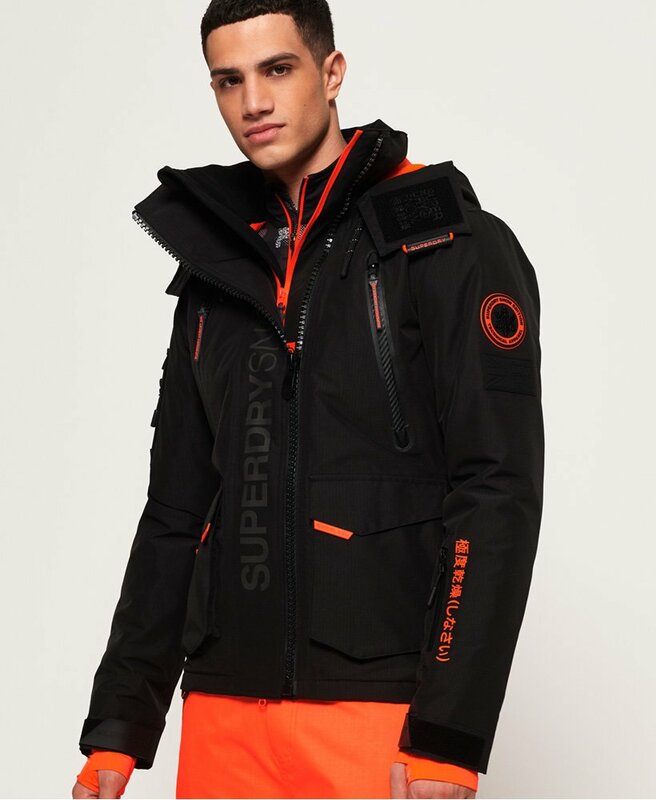 Superdry men's Ultimate snow rescue jacket. Tear up the snow in the ultimate snow rescue jacket, designed with full tech and light insulation rating. This jacket has two way zip fastening, a snow skirt and hook and loop cuffs with thumbholes. In addition, this jacket has coated zips, technical reinforced panelling, ergonomic adjusters and fully taped seams to adjust to your perfect fit. On the inside there is a media pocket and pit zip venting to allow you to cool down. The outside features pockets, including a ski pass holder on the sleeve. Each zip has Superdry branded zip pulls and tabs. Reflective detailing has been incorporated throughout, including the hood lining, the zips and Superdry logos. The ultimate snow rescue jacket has been finished with Superdry badges, Japanese inspired logos and a hook and loop placket to keep everything secure.